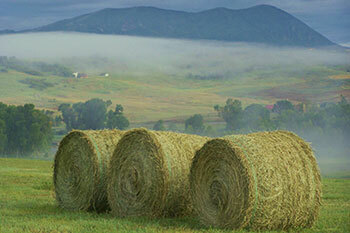 We are a diversified family operation involving ranching (cow/calf and stocker) and cattle feeding. Our headquarters ranch is in southeastern Colorado (south of Fowler). It is 150,000 acres including pastures we lease from our neighbors. We also partner on feedyards in Southeastern Colorado, Southwest Kansas, and South Dakota. The feedyard portion of our operation involves feeding a high quality corn diet to the cattle in order to produce tender, juicy beef that we all enjoy! I am the youngest of 3 brothers who are all active in the operation along with my Dad. My oldest brother, Eric, is a ruminant nutritionist and handles all matters concerning the diet of animals in our care. My middle brother, Adam, is a finance major and deals with the banking side of the business. I work mainly with the cattle feeding side of things, including risk management and customer relations. How long has your operation been in business and how many generations are involved: My dad, Bill, purchased our ranch in 1990. Myself and my two brothers are the second generation of the business. Eric and his wife, Jennie, have 3 kids that are starting off the 3rd generation. My day usually starts out studying the markets. Agricultural markets these days are extremely volatile. We utilize futures and options on the Chicago Mercantile Exchange to offset the risk of markets moving against us (such as corn going up or fed cattle going down). So, a big part of my day involves projecting costs associated with feeding our cattle and then coming up with ways to market the cattle at a profitable level given these projected costs.I also work closely with the people that supply our feedlots with cattle. They come from all over the country, but mostly Idaho, California and Washington. I work with the suppliers on good management practices that will ensure their cattle arrive healthy to our operation. Many of these suppliers retain ownership of their cattle in our facility. I work with them on everything from grain buying to marketing of their finished product. Many of my days are spent traveling to the suppliers operations.We are partners in 6 feedyards in Colorado, Kansas, and South Dakota. Each yard has an on-site manager that is responsible for the day to day care of our cattle and our customers cattle. They focus on ensuring a balanced, fresh supply of feed and clean water is available at all times to the cattle. They also focus on ensuring the cattle in our care are healthy. In order to do this, we consult with a veterinarian at each location on the best vaccinations to prevent health problems and the best treatment regimens to provide when we do have sick animals. The feedyard manager is basically responsible for making sure every day is as comfortable as possible for all the cattle. Part of my responsibilities include working with the managers to accomplish this. What is your favorite part about being in the cattle business? I love animals, and specifically cattle. Although I get wrapped up in the business side of our business and don’t get to spend direct time with the animals like I used to do, I love the fact that everything we do revolves around animals and caring for them. In addition, you can’t beat the people involved in agriculture. I can’t think of any industry with as many quality people as agriculture. Multi-million dollar deals are still done with a handshake in our industry and you just don’t find that elsewhere. What challenges do you face in the cattle industry? There are many challenges in our industry. One major challenge is access to capital. Corn used to cost $2.50/bushel and now is closer to $7.50/bushel. Our costs have tripled, which means our lending needs have tripled. Volatile markets are also a challenge. The value of our cattle can change over $100 per head in one day. Environmental regulations are also a challenge for us. We feel that nobody is more environmentally conscious than farmers/ranchers/cattle feeders, but sometimes keeping up with governmental regulations that aren’t always science or common sense-based gets to be challenging. What message would you like consumers to hear? I hope that consumers realize how passionate we are in agriculture about putting tasty, wholesome food on their table. I want them to know how much pride we take in being stewards of the land. They should also know that nobody loves animals more than the people involved in agriculture.“Factory Farms” and “corporate agriculture” are terms used to discourage the concentration of agriculture over the years. This movement disturbs me because I think there are so many misconceptions about “big agriculture.” Our operation would be considered large-scale. Some would call our feedyards “factory farms”, but we are a family operation. We care for the well-being of our livestock as much as anyone. In fact, being a little larger scale gives us many resources that smaller operations don’t have such as PhD nutritionists, personal veterinarian consultation and real-time animal health and feed monitoring. Consumers would be amazed at the technology being used today to ensure animals stay healthy and comfortable. 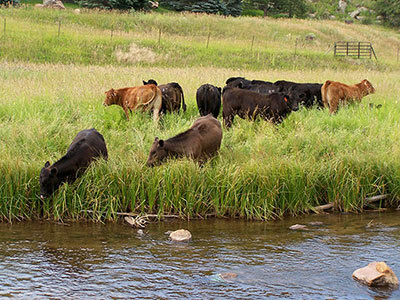 Ralston Valley Beef raises grass and grain-finished cattle, selling its dry-aged and locally raised beef directly to individuals, restaurants, and specialty grocers throughout Colorado’s Front Range. The Stanko Ranch is a small (in ranching terms) centennial ranch located just west of the town of Steamboat Springs.